HarDarshan’s yoga classes opened up so many possibilities for me. I accessed strength that I didn’t know I had, over and over which built up my self worth and also gave me the courage and strength I needed to raise my baby daughter as a single mom. I watched my body transform over a year into a lean, powerful and beautiful form that looked forward to each class and each breath eagerly. I have had the pleasure of participating in Kundalini Yoga classes led by HarDarshan Khalsa. The focus on breathing and stretching were especially beneficial. HarDarshan explains each stretch, exercise and breathing technique thoroughly so that it is easy to participate at any level. As a beginner, this helped me to feel comfortable very quickly. My life changed internally and externally when I started practicing Kundalini Yoga at 55 years old. The paradigm shift from a traditional focus on “exercise” to a more spiritual, internal ordering of the body and mind allows for each yoga practice to be its own experience for me. Kundalini yoga works me at a body consciousness that I am not always aware of, but my body is. Kundalini yoga practice is unique. Learning to be tuned in, to open the body through breathe of fire, to grow in a harmonious relationship with the body that my spirit occupies is enlightening and ever renewing. Kundalini yoga has been like finding the source for the Fountain of Youth. When I was 21 years old, I prayed for a spiritual path and a master teacher. 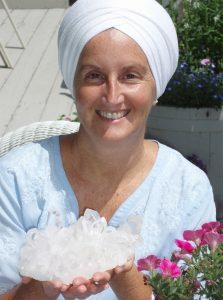 HarDarshan Kaur arrived in my life carrying the teachings and blessings of Kundalini Yoga which she taught – always emphasizing my autonomy and connection to spirit as the true healer. She helped me tremendously through several years of personal transformation and healing using the subtle, yet powerful, flower essence sessions, aromatherapy, and intuitive guidance. Her healing style and presence reflect the purity of a true spiritual seeker and wise woman, a rare gem in this age. I recommend a session with her, or several! My guided regression meditation with HarDarshan Khalsa was one of the deepest moments of transformation and awareness of my inner truth. I was held in such a supportive and inspiring space with HarDarshan that I could simply flow into all the nooks and crannies of my Self in wonder and delight. Also, I found my experience of flower essences with HarDarshan to be quite potent. It is amazing how the wisdom of which essence will fit just right creates another tool to enhance any sacred space. HarDarshan is truly gifted in her ability to intuitively connect to the needs of each moment as well as each Being through the essence of flowers.